There’s an amazing amount of variation among persimmon pudding recipes. Some start with 1 cup of persimmons, and others with 2. Milk can be whole, buttermilk, half-and-half, or cream, and can vary in amount between 1/3 cup and 2½ cups. 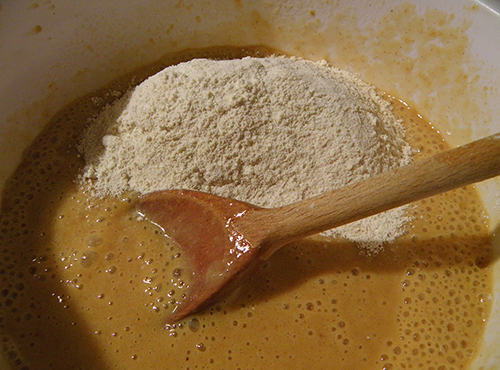 Flour amounts can be either 1 or 2 cups. Some traditional sources, like Joy of Cooking and Aunt Edna at Food.com, use ½ cup butter, whereas Joy the Baker uses only 1 tablespoon. The amount of sugar can vary from ½ cup to 1½ cups, and number of eggs from 1 to 3. 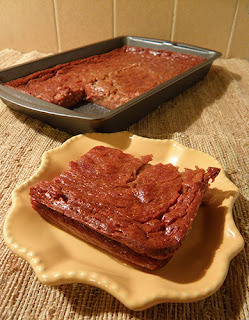 One presumably bread-like recipe uses no eggs at all, and only 1/3 cup of milk! Some recipes contain fruits and nuts. Alternatives to the traditional cinnamon-ginger-nutmeg flavoring include cloves, allspice, lemon, vanilla, and rum. Because pudding is by nature soft-textured, baking chemistry is fairly forgiving compared with breads and muffins. So one can apply plenty of artistic license when creating a recipe. And so I did. Because I have a large supply of persimmons, thanks to my friend Bill, I wanted to use as many as possible (2 cups). After my success with evaporated lowfat milk in pumpkin pudding, I chose to add a can of that. I kept the sugar and butter levels low, and used a moderate 1 cup flour and 2 eggs. Since baking soda binds the persimmon so it doesn’t get watery, I chose both baking powder and baking soda for leavening. For classic flavor, I stuck with the cinnamon-ginger-nutmeg combo. 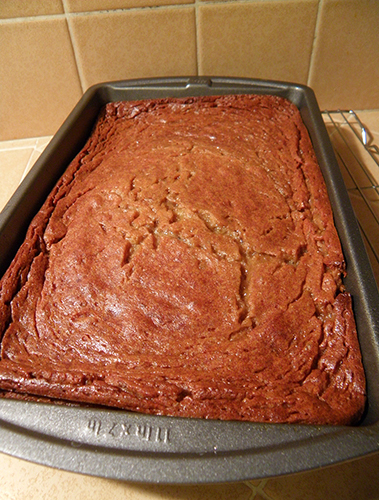 The baking pan size also makes a difference in the pudding. Wider pans will result in a shallower pudding with more breadlike texture—my husband likes these chewy parts with caramelized persimmon the best. A shorter pan will give you deeper layer of softer “pudding” on the bottom, which sets up a nice contrast with the chewy “crust.” For this latter effect, which my family prefers, use a 7” x 11” pan. Be aware that the pudding needs to cook slowly for at least 1 hour. Shorter pans (deeper puddings) will require a bit more time. It’s also best to let the pudding cool and set for at least 30 minutes after it comes out of the oven. 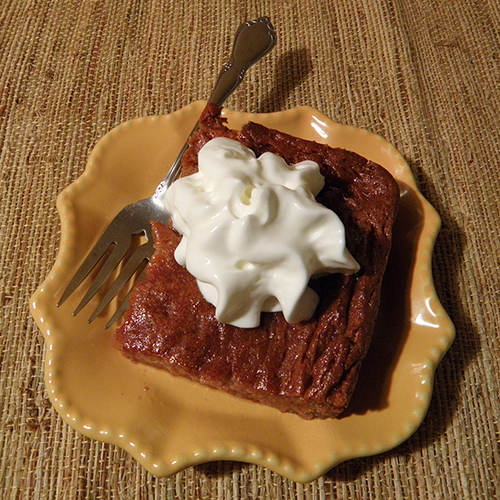 Try some pudding with the last of this year’s persimmons from the store. If you can find them, they’re super-ripe and discounted. 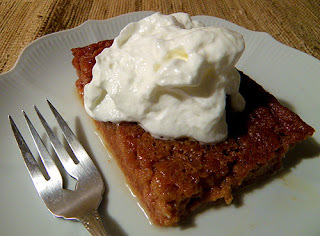 I still have some of Bill’s persimmons left, so next round I’ll try a more bread-like (low or no egg) pudding, perhaps with nuts, raisins, and vanilla. In the meantime, feel free to tweak this recipe and create a pudding of your own. You really can’t go wrong. Use an immersion blender to pulverize the persimmon pulp, or crush thoroughly with a potato masher. Stir in baking soda until uniform and set aside. This will thicken the persimmon mixture in addition to adding leavening. Butter a 7” x 11” or 8” x 11.5” or 9” x 9” baking pan. Preheat oven to 325 degrees. Meanwhile, whisk together flour, sugar, baking powder, salt, cinnamon, ginger, and nutmeg in small bowl. In a medium bowl, beat eggs with whisk until light and fluffy. Stir in evaporated milk. 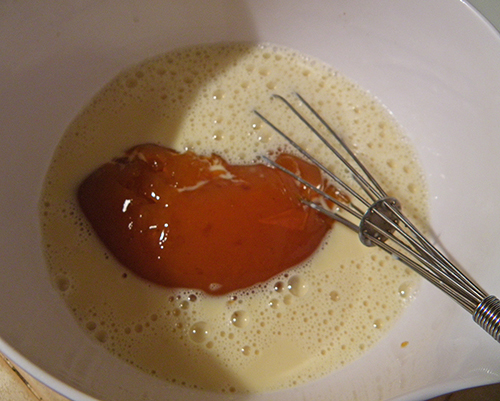 Add persimmon mixture to egg mixture and whisk until smooth. Whisk in the cooled butter (don’t cool too much, it still needs to be liquid). Stir dry ingredients into egg mixture until uniform in texture. Turn out batter into buttered pan. Bake at 325 degrees F until completely set and slightly browned if desired. Toothpick will come out clean. Time will vary with size of pan, but allow at least 1 hour baking time. Remove from oven and set on cooling rack. Allow the pudding to set for at least 30 minutes before serving.